Carte’Are Gordon is shooting 61.9% from the field and has been a force to be reckoned with on the defensive end of the floor. 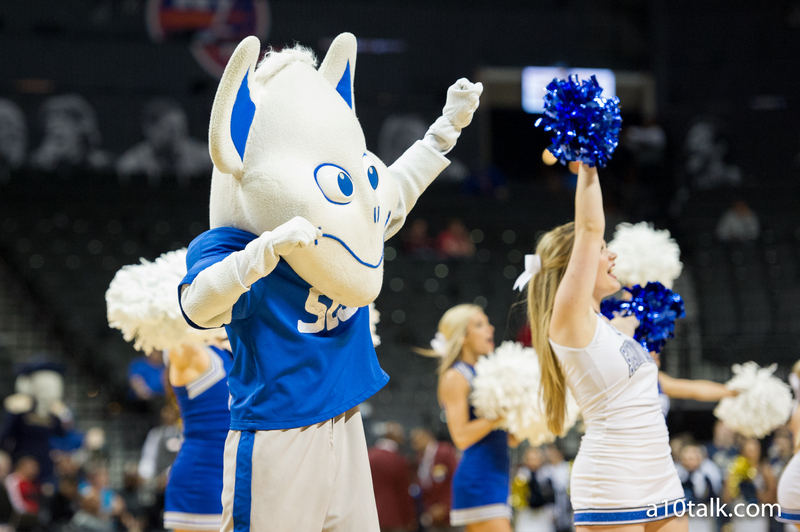 Despite a shaky start to the season against the likes of North Alabama and Southeast Missouri St., the Billikens beat Seton Hall on the road to prove their legitimacy. Carsen Edwards and co. were difficult to stop, but the Wildcats got out of Charleston with 2 important wins — Wichita St. and Northeastern — and a 3rd place finish. Jon Axel Gudmundsson had the best game of his career to down the Shockers in round 1. The ‘Cats get Northeastern once again this week. An up-and-down weekend for Saint Joseph’s featured a 1-2 record in Myrtle Beach, though the Hawks faced difficult and lengthy UCF and West Virginia. Missing 11 free throws and having Charlie Brown foul out midway through the 2nd half, a 7 point loss to the Mountaineers will go down as “what could have been.” The Hawks have some tricky games coming up but looked prepped with the way Brown has been playing. Fatts Russell’s buzzer beater lifted URI over Harvard to bounce back after a frustrating night on the road against Charleston. Guard play continues to impress in a year where Rhode Island is expected to rebuild. David Cox is hanging tough in his first year as head coach — beating the Crimson was a big morale boost. Josh Cunningham’s return to the starting lineup means the Flyers have all their weapons, though they looked a bit shaky on Friday night against Purdue Fort Wayne. Regardless, we get to see what the Flyers are made of this week when they go down to play in the always-difficult Battle 4 Atlantis. Butler awaits in round 1. Like Dayton, VCU has yet to get thoroughly tested, though we’ll know a lot more about this team when it faces off against Temple at the Barclay’s Center and possibly St. John’s. Marcus Evans’ return has not been quiet — he’s played limited minutes but has made a profound impact all over the court. When he becomes fully integrated in the coming contests, the Rams could be deadly. Like the former 2, this middle of the pack is hard to rank, as Duquesne needs a tough contest to be fully gauged. Luckily, a date with Notre Dame in South Bend this week is a good glimpse. The Dukes looked strong in their win over Radford this weekend, and Eric Williams Jr. has 2 double-doubles on the young season. I think the Irish could be on upset watch if they sleep on the Dukes. Expectations have unfortunately been lowered for the Minutemen this season following back-to-back home losses to Harvard and Howard. While the former was acceptable, the latter, frankly, was not, and it’s clear this team has some growing pains coming out of the A-10 cellar. I’m hoping Matt McCall and co. improve as the season progresses, but it feels like 2019-2020 is the year the Minutemen might go dancing. You can’t sugarcoat how poor George Mason has been this year, and even though it got its first W this weekend over Southern, it wasn’t pretty. The Patriots really need to grind it out and solve their problems. Turning the ball over has been quite the achilles’ heel. Dave Paulsen needs to get his guys sharp. You would think that a home loss to Longwood would keep the Spiders below 10, but 2 wins (along with some brutal losses across the rest of the league) have them up to 10 this week. Sophomore Nathan Cayo had a strong game against St. Francis NY, which is pivotal in taking the weight off the big 3’s shoulders. A loss to Niagara was bad, but the Bonnies have been without Courtney Stockard and LaDarien Griffin, meaning they’re playing with essentially freshmen. Though the 2 seniors will help the Bonnies a lot when they return, it’s not looking like the most promising season in Olean. La Salle is 0-4, and despite a good, hard-fought showing on the road against Florida, it turned around and lost at home to Drexel. Those are the kind of games you cannot afford to lose. Winning 3 straight, including a buzzer beater over Columbia on Sunday, Fordham is out of the cellar and into the 13 spot this week. Freshmen Nick Honor and Jalen Cobb have been bright spots for the Rams. If an 0-5 start to the season doesn’t tell the whole story, a 90-55 whooping by South Carolina does. The Colonials shot just 18.5% from three against the Gamecocks.